I have been baking with coconut flour a lot these days. I like it because it is grain-free so it is well-tolerated even by those who have problems digesting and metabolizing grains. And in general, I am a big fan of coconut– coconut flakes, coconut milk, coconut oil, coconut water and now, coconut flour! If you are curious about the health benefits of coconut, here you go! I use the “Let’s Do Organic” brand of coconut flour. You can easily find it at any health food store! 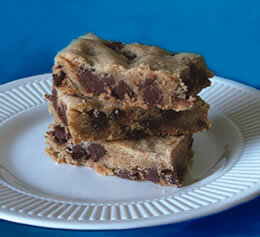 These blondies make a nice desert for you and your family. They are grain-free (thus gluten-free) and refined-sugar free. 1. Preheat oven to 350 F. Combine all wet ingredients in a food processor- dates, coconut oil, maple syrup, eggs and vanilla. Process until smooth. 2. Combine all dry ingredients (almond flour, coconut flour, baking soda and salt) in a bowl. Mix together. 3. Add wet ingredients to dry ingredients and mix. 4. Add in chocolate chips. 5. Spread dough in greased 8×8 inch pan. Bake for approx. 22 minutes. Let cool completely before serving.